This is one of the more fascinating itineraries of the Promontory, with a panoramic view over the seaside and the coastline and many particular points of interest. This is a difficult path, there are chains to facilitate the transit along the exposed sides, it isn’t recommended during hot summers and it is suitable only for expert and well trained excursionists. The itinerary starts from the San Rocco church and develops along the western side of the Mt. Portofino. The easy and flat mule-track runs through the Poggio and Mortola areas. From Fornelli the path moderately rises and falls as you enter a mixed wood due to the development of natural vegetation grown under a rather thin cluster-pine wood. Holm-oak, mannas-ash, arbutus trees and many elements of the Mediterranean maquis form a thick vegetable curtain opening with panoramic views over the Golfo Paradiso. You are walking on the conglomerate rocks, that outcrop in some area where scattered rock plant grow, as also you can see from the deep fractures and shears that form series of small damp and shady valleys along the whole route; in these trenches the blanck hornbeam mesophilic wood replaces the previous mentioned vegetation, determining particular microclimate conditions in contrast with that of the environments that you have just passed through. After the forth cutting from the Fornelli area the path rises suddenly for about ten meters reaching a subvertical conglomerate face where the very rare spatulate saxifrage grows, symbol of the Park. You soon reach an old military building on a rock spur, known as “Gruppu Marsu” in the past and “Belvedere” nowadays on the ridge which goes to Punta Chiappa. 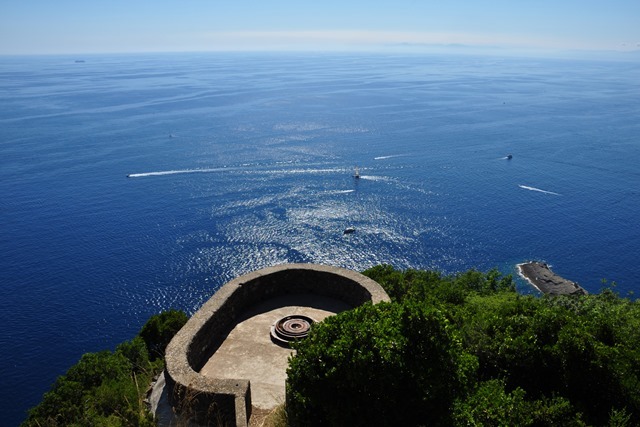 From this natural balcony you can enjoy a wonderful view of the western side of the Promontory and the entire “Riviera di Ponente”. Now you continue for a long walk towards the more exposed and dry part of the Park, covered by Mediterranean flora, with about a hundred species associated to different vegetation from rock plants, to garigues, various kind of maquis that grow over the whole ground, meadows of Mauritania grass, a huge plant that you will see along the whole route, with its culms curved by the weight these typical ears. You also pass an area once known as Erbaio and now named Batterie, where there are military buildings (bunkers) and associated structures. Near Punta Chiappa you can see the “Crosu” from where the little and occasional water carried by the Bricco stream springs into the sea, through the thick and green Mediterranean maquis. Seawards the conglomeratic tower of Mt. Campana soars; crossing its slope you need to walk in a semi-circle which leads to a progressive change of view points. Here there is the famous Bacio pass, that according to excursionists is at 200 m above the sea level. However this gap between Mt. Campana and Punta Budego is much lower, is much lower at about 126 m a.s.l. The passage is quite easy, even though it’s extremely exposed as are many other subsequent passages, and equipped with chains for the excursionists’ safety and psychological confidence, particulary welcome when the ground is wet and slippery. The Bacio is connected to a sad legend about the last kiss of two contested and desperated lovers before their suicidal and liberating jump. You now continue downhill more gently, just over the dark and deep sea below, that is blinding on sunny days. You may be amazed by the presence of the arboreal euphorbia, a roundish shrub a few meters high that withers in the spring months and loses its leaves in summer. Its branches are like huge corals and contrasts the blue colour of the sea. You can see against the light a sequence of grey-blue steep hillsides plunging into the sea, bounded by thin crests and ridges with unlikely scrawls of indenting squared rocky towers. The route winds along the western side of Cala dell’Oro followings its uneven morphology. Among the beautiful sight of the area, besides the peregrine falcon, you can find a rare butterfly, Charaxes jasius, whose caterpillars feed on strawberry tree leaves; once was very common along the Mediterranean coasts but now is rare because of the disappearance of the maquis. The sweet smell of the maquis and the deep green of its vegetation is constantly present on this part of the path, that slopes gently towards the sea with incredible panoramic views of the eastern side of the cove closed by the flank of Termine with the Torretta at the end. Near the pass you find traces of mule track on the left, now fallen into disuse, that linked San Fruttuoso to Sella Toca. The descend to San Fruttuoso goes through a sort of evergreen plant tunnel formed by a thicket: an intermediate stage of vegetation, a mixture of maquis and wood that develops when the higher arboreal vegetation, such as holm-oak, manna-ash tree and strawberry trees, shade most of the undershrub. The descend is quite easy and alternates the thicket with stretches of shorter vegetation, as the rocky plants and the “gariga”. route to the Torretta, an ancient tower built by the Senate of the Republic of Chiavari in 1561. You can also see Torre Doria, the other tower, among the silvery fronds of the olive groves and the dark wood where are a few extraordinary Aleppo pine-tree specimens, before reaching the village. 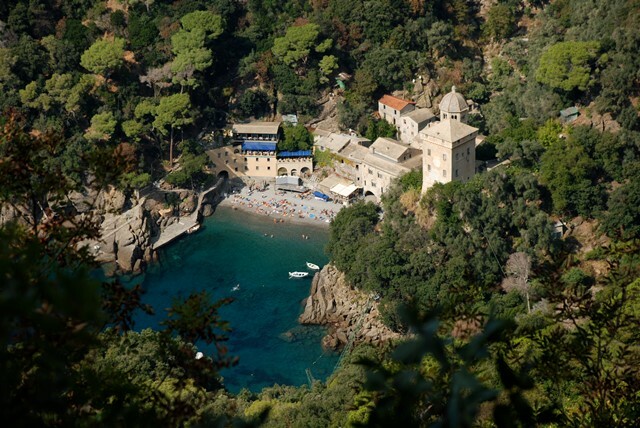 You can choose here, either to turn towards the dock where the boat to Camogli, Santa Margherita, Recco and Portofino leaves, or to reach the san Fruttuoso Abbey and take the time to visit the monument and the whole village, as recommended.